When it comes to backcountry sleep systems, we have come a long way since the days of the cowboy bedroll. Today we can choose from an array of closed foam, self-inflating, and manual inflating mattresses and sleeping pads. If you are shopping for a new one, it can be so overwhelming that you might feel like just digging out your grandpa’s bedroll. 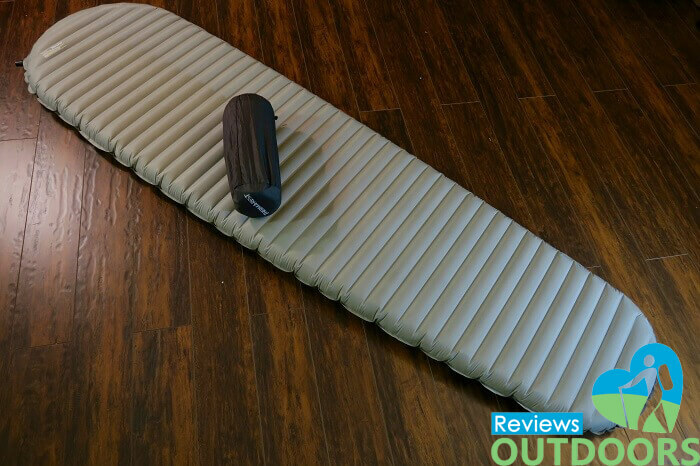 Hopefully, our article below will give you some clarity on which is the best sleeping pad for backpacking. 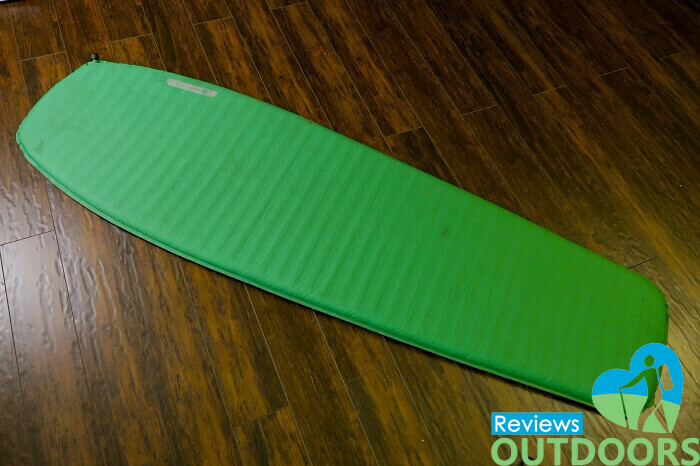 Sleeping pads range in price from less than $10 USD to over $200. 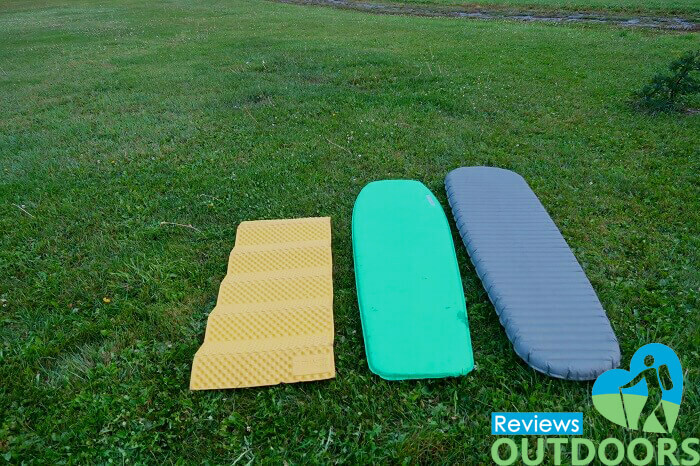 You don’t need to spend a week’s wages on a camping pad to have a good time, but a little extra money on a sleeping pad for backpacking is a good investment especially if you plan on using it often. Unless you are sleeping in a warm climate, insulation from the ground is crucial. Most companies provide an R-Value for their pads. The higher the number, the warmer the pad. While R-value can go higher than 10 in pads, you wouldn’t really want to carry anything heavier than R-6. R-2 to R-3.5 should be adequate for three-season use. If you sleep cold or live in a cold climate, adjust accordingly. You need to be comfortable. If you’re a side sleeper, consider getting thicker pads. Thickness can range from around 1 to 9 cm (0.4 to 3.5 inch). This is a huge factor for some people. A light weigh pad usually comes at an expense – either in money, insulation, comfort, or size. 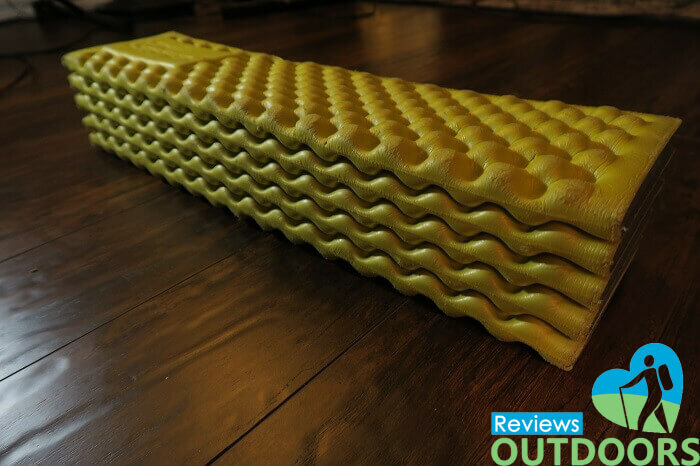 Sleeping pads are often narrowed at the head and feet to cut down on weight, which may not be ideal for people who move a lot in their sleep. You can also often find pads in extra long, extra wide, and short. Also, consider it’s size when packed – the smaller the better. 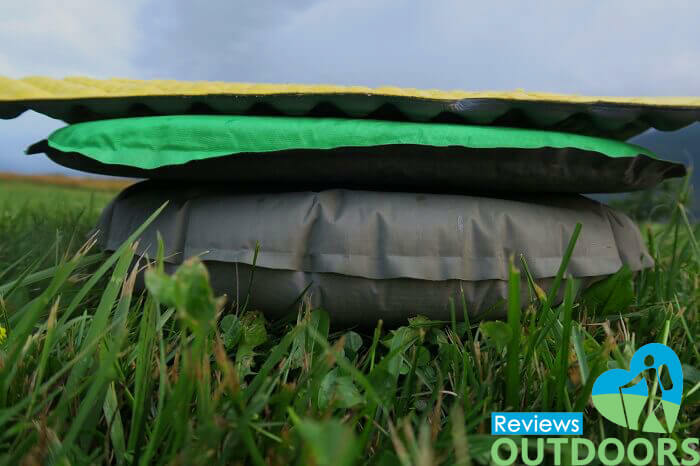 Air pads are relatively new to the market and have quickly taken their place as a favorite among backpackers. They are manually inflatable pads made of very light materials. They pack the smallest and provide the most comfort and insulation for their weight of any other pad. Most air pads contain some form of insulation either in the form of down, synthetic material, or reflective compartments. They can weigh as little as 241g (8.5 oz), like the Klymit Inertia X Frame Ultralight Backpacking Pad and you’d be hard pressed to find a regular-sized, three-season one over 800 g (2 lb). Air pads can be incredibly warm. The ExPed SynMat has a whopping 6.0 R-value, which is enough for cold winter conditions. Of course, they are also the most expensive of the three, with prices for high-end ones well over $200. Air pads in the $50 range tend not to be insulated so check the R-Value. If it’s around 1.0, it’s probably not insulated. Another downside to air pads is that they tend to be loud. Since many air pads are made of a network of reflective mylar, moving around can create a lot of crinkling. If you invest in one of these, you’d better hope your hiking partner is a deep sleeper. The crinkling can be worth it though. With no need for insulation, the Therm-a-Rest NeoAir Xtherm (pictured above) weighs 570 g (1.3 lb), has an R-Value of 5.7, and packs very small. Self-inflating pads are open-celled foam pads surrounded by an airtight layer. When the valve is opened, the foam expands and theoretically takes in the air. Of course, anyone who owns one knows that this doesn’t always happen. They typically need at least some manual blowing up. Storing them semi-inflated with the cap open will help keep the foam in good shape. They are cheaper than air pads, and you can find them for under $20. Higher end ones can still cost over $150 though. These pads tend to be more durable than air pads. Even if one has a leak, the foam still provides some comfort. My first pad had an unpatched slow leak in it for years before I finally replaced it. R-values on main brands seem to stay above 2.4, but cheaper brands often don’t publish R-values. You can get some fairly light self-inflating mattresses in the R-4 range, but unless you want to all around an extra 2 kg (2.5 lb), you aren’t going to get the level of comfort or insolation you’d get with an air pad. Self-inflating pads are the heaviest choice, though you can find ones that weigh around 500 g (1.1 lb). Therm-a-Rest was the first to develop this technology in the 70s and they continue to lead the market. The Therm-a-Rest Prolite has gotten me through many a long night on the trail. At 510 g, it’s one of the lightest self-inflating pads on the market. Its R-value is 2.4, making it a great choice for three season use. Closed foam pads are the lightest and cheapest option. While you can get a cheap one for less than $10, paying $30 will get you one that is molded for extra comfort and insulation, and covered in a reflective coat. The Therm-Ar-Rest Ridge Rest has an R-Value of 2.8 – not bad for a piece of foam! They are also very light, weighing in at under 400 g (0.9 lb). The other benefit of closed foam mats is durability. They simply cannot pop. The downside is that they aren’t very comfortable. With less than 2cm (0.8 inches) of thickness, they don’t exactly get you far from the ground. They are also bulky. Most people wear them on the outside of the packs, and while water doesn’t soak into them, you’ll still want something to keep them dry in wet weather. Despite the discomfort, closed foam sleeping pad for backpacking is my favorite, at least in the summer. I have a small size Therm-A-Rest Z Lite. I’ve abused it for years now, and it’s really not that comfortable, but it weighs 290 g (0.6 lb), keeps me warm, costs a fraction of some of the other pads, and doesn’t care if I accidentally stab it with a knife. Thanks a lot for your recommendation. Enjoy camping!